September, 2014 - Pygmalion's Art Supplies is pleased to announce the completion and installation of a new work of public art in Bloomington. The eight by sixteen foot mural, titled ‘Red Studio’, is on the north side of our building, across the alley from Quaff On Bloomington. 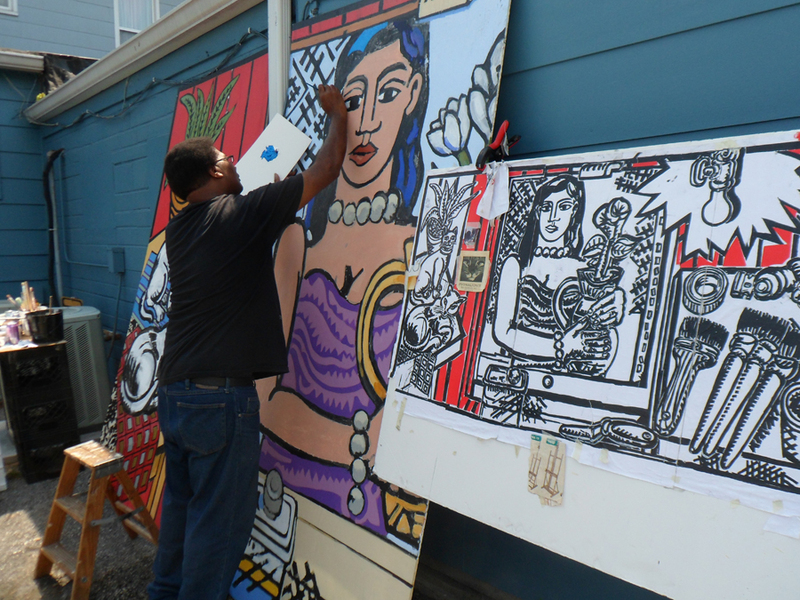 Bloomington artist Jim Sampson designed and painted the mural in a bold, graphic, but painterly style. 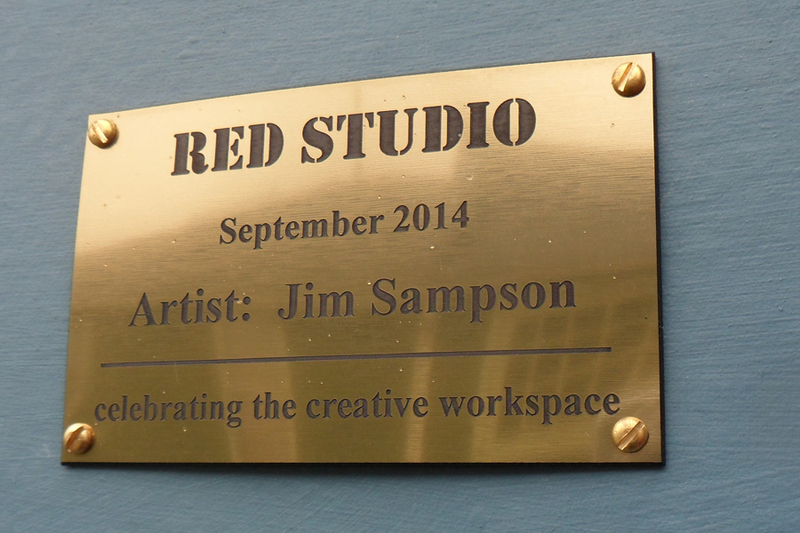 The painting depicts an artist’s studio, red, of course. 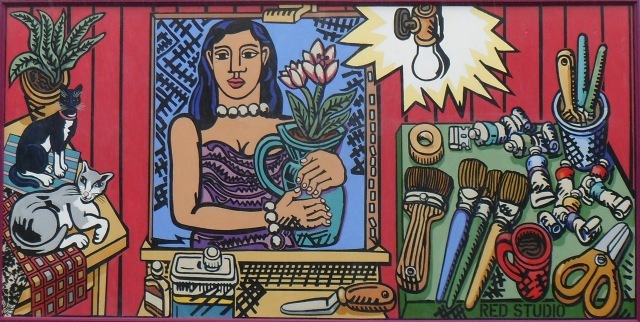 In the studio a bare light bulb illuminates an easel, which holds a portrait of a woman with a vase of tulips. Next to the easel an array of art supplies, and a cup of coffee, sit on an old green table. And to the left of the easel, on another table, sit our resident cats, Alice and Kiki. Alice is the gray and white cat, and Kiki the black and white tuxedo cat. Alice looks out to the viewer eager for attention, as she does in life, and Kiki has her cool, half asleep look. Pygmalion’s friendly store cats have been a Bloomington fixture for most of the store’s over forty year history. Along with Alice and Kiki, various objects in and around the store inspired Sampson in his composition of the mural. Patterns for the fabrics that each of the cats sit on was derived from decorative papers that the store sells. Observation of flowers in the garden in front of the store led to the creation of the painted tulips. And of course the depictions of the art supplies, tubes of paint, stylized brushes, palette knife, roll of tape, came from products that Pygmalion’s sells. 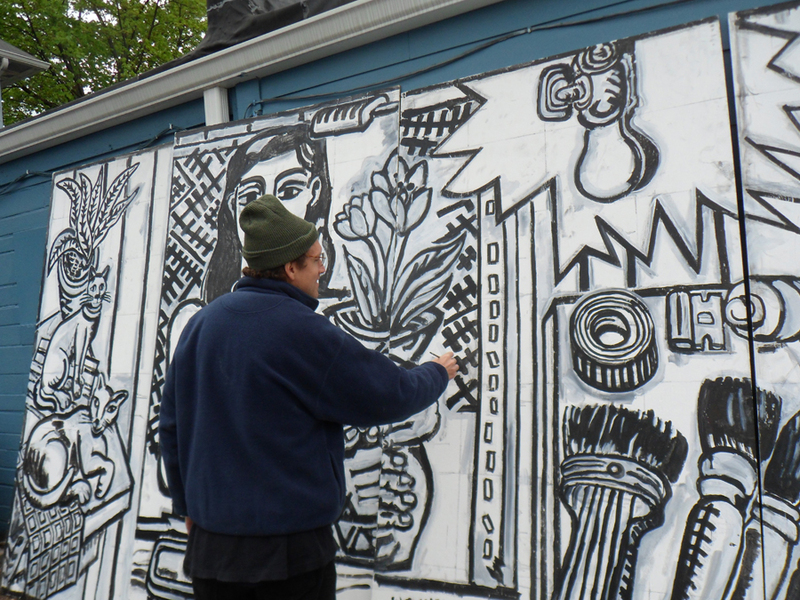 John Wilson, the current owner of Pygmalion’s, and Jane and Werner Otten, the previous owners, commissioned Sampson to create the mural. 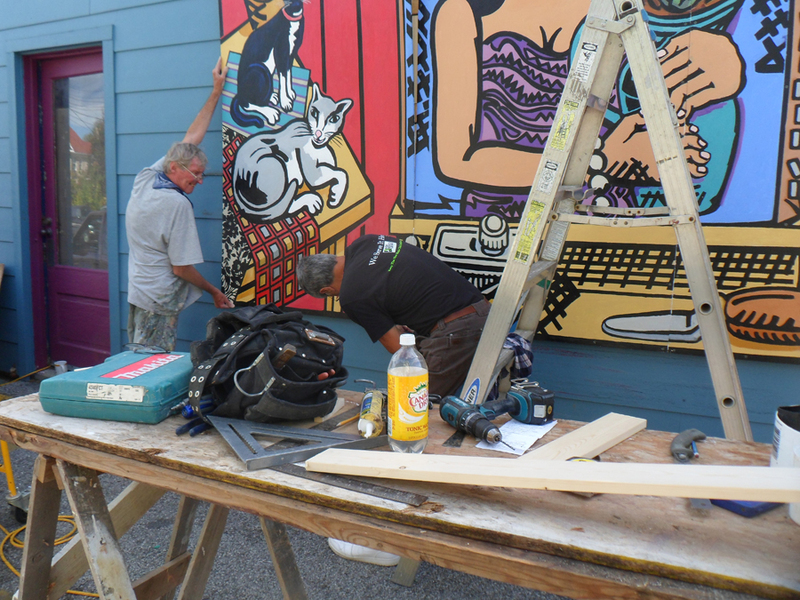 This project is only the most recent in the store’s long history of valuable contributions to the local arts community. 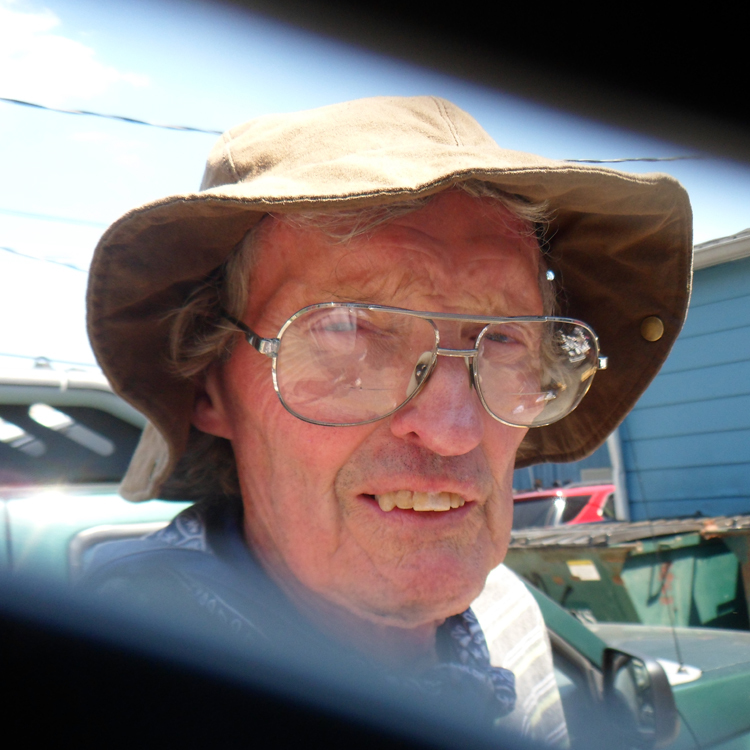 Both Wilson and Jane Otten are participating members of IU’s Friends of Art organization. For the past five years Pygmalion’s has commissioned a custom oil paint color, donating 100% of the proceeds from the sale of the color to a local non-profit. This past year’s color, Eggplant, helped establish a youth scholarship fund at Ivy Tech. The Monroe County State Fair, Rhino’s Youth Center art programs, and IU Summer Study Abroad Programs in Italy have also received annual support from the store. 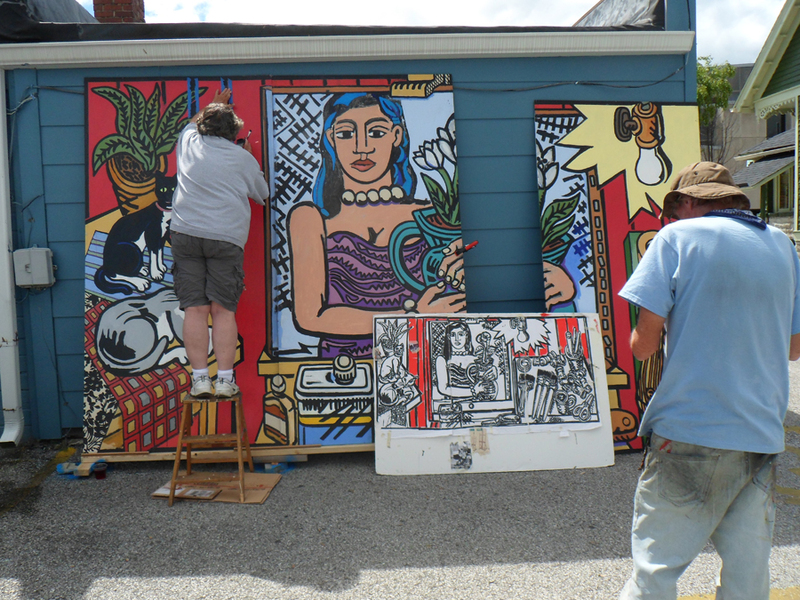 ‘Red Studio’ is a wonderful, strong addition to the downtown Bloomington mural art project!